Well well, what have we here? I show this picture (or my junior high or high school yearbooks) to people who I met later in life and they do a double-take. "They're almost all Black!" they exclaim. "You were in that class??" Haha, yeah, so what? I can honestly say I have absolutely no regrets about the schools I attended. I feel blessed for the perspective it gave me. I also strongly believe that it doesn't matter what school it is, it is what you make of it that counts. 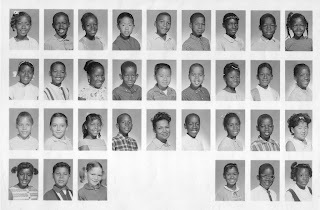 The above is my 3rd grade class picture (click on it to enlarge) and that's my teacher, Mrs. Wilson right there in the middle. She was one of my all-time favorite teachers. One, because she was nice, but more importantly, she actually took the time to talk sense into us. By talking sense into us, I mean she would actually sit there and tell us how we should behave - what was right and wrong, how we should treat others, how to be respectful to people, etc. Not in an authoritative or condescending way, but in a matter-of-fact, caring way. She taught us how important it was to be ethical, and to maintain a good sense of morals. Don't you think that is something sadly absent from the school experience these days? I do. These days she'd probably get fired or sued for trying to "force" her values onto her students, no matter how upright those values were. I suspect she has passed on from this world, but I hold a dear place in my heart for her and have always been thankful for the way she cared about her students. Edgar and Michael were my best buddies. The last person in the picture I saw (knowingly, that is) was Sterling and that was over 30 years ago.